I will have to talk to my mother to be sure, but I am fairly certain that I didn’t have an imaginary friend when I was a kid. Instead, from a very young age, I had books. (P.S. Thanks Mom!) Page after page of interesting people and fascinating places. I would retreat into a chair, crack open the story du jour and be transported from the ‘burbs to the past, to the future, to alien worlds, to fantastical realms, and just… away. Yes, the people that lived in those little blobs of ink were very much alive in my imagination. But I never made my parents set an extra place at the table, cried if someone sat on a being they could not see, made up a fake language to talk to him/her in… nothing like that. Then, by the time I was in middle school, I had my own books and characters. Short stories quickly expanded to novellas which gave way to novels – mostly because I needed to spend more than twenty- or thirty-thousand words with these people. If you are a fellow writer, can you tell me – do you remember your earliest characters? Are they the ones that stick with you to this day, or have they been supplanted by newer ones over the weeks, months, years? I know the protagonist of my first actual novel was named Whitney. She was a fifteen-year-old girl with long dark hair and big blue eyes. Whitney was kidnapped in Chapter Two and spent the novel trying to escape her captors. I do not recall any other details about her or the story, and to be honest, I only remember that much because I had named after and described her like my favorite Barbie Doll (Hey! Stop laughing, I was 11 and my Barbies hung around to ‘act out’ my stories for me. I like to think that I wasn’t a lame nerd girl, I was just getting some early practice in dialog!) Whitney may have been a great, well-rounded character. I sort of doubt it. If she were, I would probably remember her. Which characters have stuck with me over the years? Which characters do I still think of fondly and think of as… long-lost friends? I remember Alex from Death in the Family, and his mad momma Marsha. He was a strange-looking, deranged kid and if he had not ended up tangled up in his mother’s plot, he probably would have blown up the school or pulled a Columbine. I guess I should be glad he was both fictional and…well, *Spoiler Alert* dead by the end of the novel. I loved Teya from my TED trilogy. Bitchy, riotous, with a tough-kid attitude and biker boots – she was also altruistic, fell hopelessly in love with a man she could never have, and eventually sacrificed everything for her friends (and the world, natch). She was not the strong silent type, as they say – she was way too loud for that – but she endured so much and conquered it. Not with the frothy optimistic grin of her compatriot, Sarah, but with a gritty determination. She came from a pretty bleak place but clung to her hope in the face of the worst the universe had to offer. There are other characters from TED which I could easily add to this list. Mostly, I suspect, because I spent a good three years of my life with them. Gaea, Tristan, Bati, Grace, Aides, Saturnia & Karena. Above them all, Teya. Summit and Shalisa, through all their incarnations, have remained dear to me. Pyrathe, who allowed me to ponder more about morality and good and evil than any other character on the list. Will, who buried his sister and saved the Princess, all set to a playlist of Bryan Adams songs (Hey! It was 1992!). Alonwyn, with her long, thick braid, her long, thick blade, and her unshakable faith. Sefiro, who Jack derided as being a poor main character because he often took second place to his elder sister in physical pursuits but who had so many wonderful traits to offer beyond swinging a sword. Garrick, the closest thing to an anti-hero in my repertoire; he’s a deeply flawed, deeply principled man who does the unthinkable to protect that which he loves. Natallia, the White Tail, and Unca Tom, her mentor. Damarin, the church’s assassin. Badger, a boy living in a post-apocalyptic world whose job it is to protect the ‘One’. Vanyne, an unapologetically sadistic young woman with lofty goals for her people, and her daughter. General Abeterus, who is featured in an up-coming Snippet Sunday called “Satiating Appetites”. And Alexander, from Incandescence. He’s a bad man, he is. But he’s also somehow disarming and charming and- bad. A bad, bad man who does and condones some very terrible things. I can’t help loving him a bit. His cousin/companion, Isaac. Hannah, who is so unlike me as a teenage girl, and Michael, who really does the best he can in the fucked-up situation in which he finds himself. Their great-great-grandmother. Yes, I admit it, I do have imaginary friends today. In my crazed writer’s brain, I have held entire conversations with Alexander and Isaac, trying to suss out their true motivations. Hannah has stopped by to let me know that she had lots of online friends and did plenty of texting despite living a pretty sheltered existence. Current characters, new ones (with awful timing, of course! ), old ones. Many of them live up there in my grey matter, harassing me to stop blogging and get back to writing about them. Cheeky little buggers. Throughout my life, I have been surrounded by fascinating characters – on and off the page. Somehow, I observed a lot more than I was aware of at the time, and these mental character sketches have stayed with me through the years. Occasionally, they end up dotting the pages of my own pieces now despite my assertion that I don’t “make-up” characters. I cannot deny that ‘Isaac’ in Incandescence is influenced by a friend and there is no doubt that I see pieces of one of childhood bullies in the butthead children running around my stories. There is no way that people I have known in my years have influenced the people that populate the worlds of my novels. Still, by and large, I don’t really make conscious choices to model characters at all. I prefer to believe, no matter how silly and vain some would say it is, that these characters appear to me to tell their stories. Sometimes, they become more fleshed out on the page, but usually, at conception/discovery/whatever, they already ‘are’ people. I just have to get them onto the page effectively. Posted on April 5, 2012, in Uncategorized and tagged characters, childhood, writing. Bookmark the permalink. 3 Comments. I had a lot of imaginary friends in books as well. And, I, um, also broke into my sister’s stash of Barbies to act out things. We may have been separated at birth. 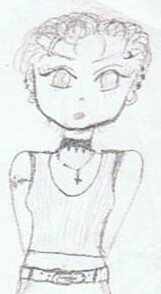 I cannot believe I actually posted one of my original High School era “manga-style” drawings on this blog.